Floor standing speakers can bring a whole new look and experience to any home. 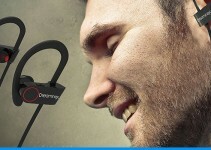 They create a concert-like music experience and also provide high-quality sound. Whether you are looking to improve the quality of music in your home, create an amazing music feature for a party, or simply improve your home entertainment system, floor standing speakers are a great option. They can provide a depth and tone hard to replicate in other types of speaker. 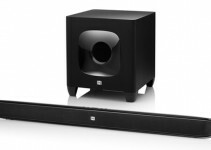 They can also look pretty impressive, adding an aesthetic quality to your music room or theater system. The best floor standing speakers can be pretty hard to shop for though, to get the right bang for your buck. To help you out there we’ve put together a great little comparison table and reviews of what we consider to be ten of the best floor standing speakers on the market today. 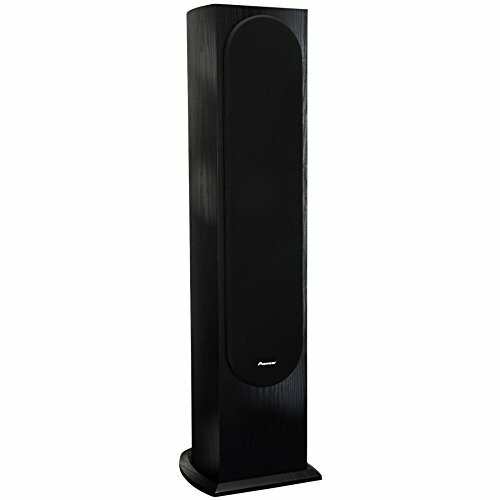 The Pioneer SP-FS52-LR Andrew Jones Designed Floor standing Loudspeaker is a number one best seller. It is set in an RF molded curved cabinet and has three 5.25″ structured surface woofers. It also features a 1″ high efficiency soft dome tweeter, gold 5-way binding posts, and an 8 element complex crossover. The curved cabinet design gives the speaker an aesthetically pleasing look, but it also improves your listening experience. The stiffer design reduces sound waves inside the cabinet which results in exceptional sound quality. This speaker is sold in a single, so it can be a great choice if you are only looking to purchase one speaker or need an odd number of speakers. If you’re looking for an affordable, well-made and reliable floor speaker, this is a great option. 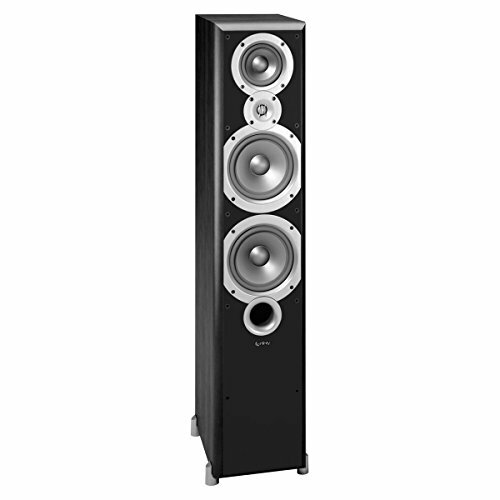 Onkyo SKF-4800 2-Way Bass Reflex Floor-standing Speakers are just over 40 inches tall and are sold in pairs. These speakers are very stylish and can be used to compliment a stereo system, or build an entire surround sound system. They feature twin 16 centimeter cone woofers which are capable of handling dynamic classical scores and rock anthems with equal composure. A 2.5 centimeter soft-dome tweeter, and maximum input power of 130 W is sure to improve your music experience. The woofer equalizer enables fast and accurate responses. These best floor standing speakers are ideal for playing a variety of musical genres, or improving surround sound while watching movies. 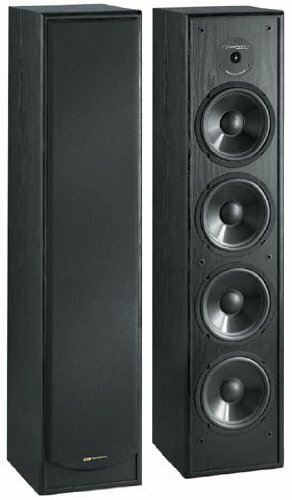 The BIC America Venturi DV64 2-Way Tower Speaker in Black can be used as a traditional stereo speaker or a front speaker in a comprehensive surround sound system. This speaker is sold as a single, which makes it ideal for customers looking for one floor speaker, or an odd number. This speaker is designed for high performance and features one .75″tweeter along with dual 6.5″ poly/graphite woofers and dual passive radiators that ensure bass extensions. The speaker is set in a rich, black wood-grain cabinet which makes it as visually appealing as it is musically pleasing. These best floor standing speakers have a seven year warranty and are magnetically shielded to prevent video interference. The Infinity Primus Three-way dual 6-1/2-Inch Floorstanding Speaker features incredible sound at an incredible price. This three-way floorstanding loudspeaker has dual 6.5″ – 165mm MMD low-frequency drivers, a 4″ – 100mm MMD midrange driver, and a 3/4″ – 19mm MMD hi-frequency driver. The speaker’s midrange production is neutral which provides inner musical detail from any type of music at any volume level. This speaker is sold as a single and features a stylish design along with five-way binding posts. This floorstanding speaker is a top seller and very reasonably priced making it ideal for any customer. 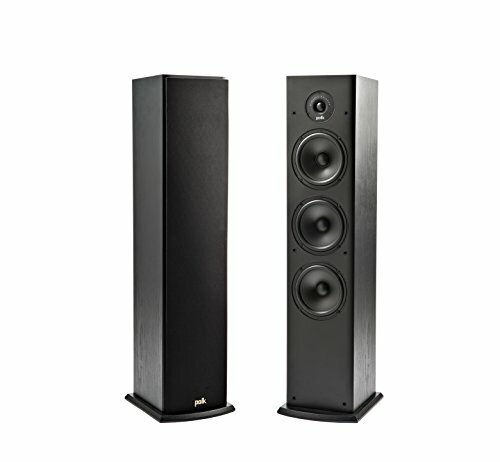 The Klipsch R-26F is a floor standing speaker that brings you superbroom filling, lifelike sound quality. This speaker is sold as a par but also available as a single and features dual 6.5″ copper-spun high-output IMG woofers that are ideal for high-powered bass, making it a great speaker for a surround sound system. It also brings with it the Klipsch proprietary 90×90 Tractrix Horn technology and dynamic 1″ aluminum tweeter to provide an incredible audio experience. This speaker is ideal for listening to music and as a surround sound option. 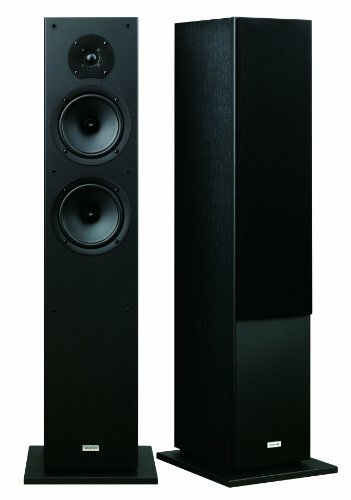 The Polk Audio Monitor60 Series II Floorstanding Loudspeaker is just over 37 inches tall making it an ideal size for any room. It has a simple design allowing it to blend with any home’s décor. This speaker features a 1″ (25mm) fabric/polymer composite Dynamic Balance dome tweeter and 5.25″ bi-laminate composite Dynamic Balance drivers. This speaker delivers wide dispersion, better mid-range, and a more detailed bass response making it an ideal choice for anyone looking to improve their music experience. It is available in a black or cherry finish, features titanium faces and has bold, fat stabilizer feet that ensure stability on carpet or hard floors for more precise bass response. This speaker is sold as a single and has been coined with the name “monitor”. 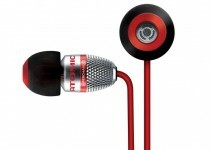 This means that it offers a simple, sturdy construction along with clear, accurate sound and powerful bass. It is available at a low price for such a high-quality speaker. This speaker features a 1″ (25mm) silk/polymer composite Dynamic Balance dome tweeter, four 6.5″ composite dynamic drivers, and two mid-woofers. The finish on this speaker is wood grain and it has modern titanium faces. 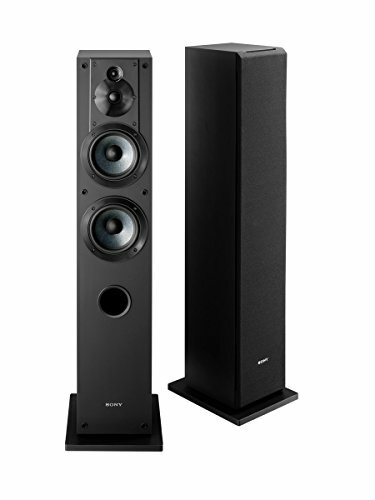 If you’re looking for a simple floorstanding speaker addition for your room, but want it to blend in with your décor, the Sony SSCS3 3-Way Floor-Standing Speaker is a great choice. It is just over 40 inches tall and has a sleek, all black design. The Sony SSCS3 is sold as a single and features a 3-way, 4-speaker bass-reflex system along with a 5.25″ foamed-mica cellular reinforced woofer and 1″ polyester main tweeter. It also offers an optimized crossover componentry for a clear audio path. This speaker is affordably priced making it ideal for anyone looking to improve their music experience or surround sound experience. The Polk Audio T50 Tower Speaker is the least expensive on this list but don’t let that make you think it does not provide an amazing music listening experience. It features a simple design in black that make it an ideal choice for any home. The Polk Audio T50 Tower Speaker is built with Polk’s Dynamic Balance technology which features a 1″ silk dome wave guide tweeter for treble and a 6.5″ extended throw composite for dynamic bass. It is easy to set up and has two 6.5″ mass loaded composite sub bass radiators for powerful output bass at the lowest frequencies. If you are looking for a pair of unique floor speakers, the ultimate indulgence and extravagance for your home, the Waterfall Audio “Niagara” Diamond Glass Floor Standing Loudspeakers might peak your interest. The Niagara is as much a work of technological art as it is a speaker. These speakers feature an extremely unique 15 mm thick high-density Diamond glass setting that will blend with any home’s décor and help eliminate unwanted vibrations from the structure of the loudspeaker. The acoustic dampening tube allows proper function and guarantees a sharp bass and mid-range reproduction. 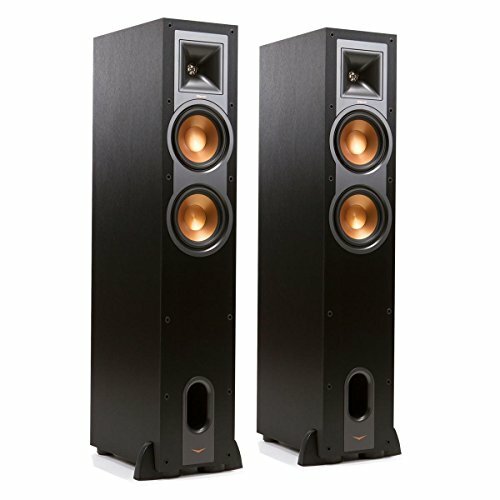 These floor speakers come with a two year warranty, and are sold in pairs, but they are an extreme indulgence with a price tag to match.